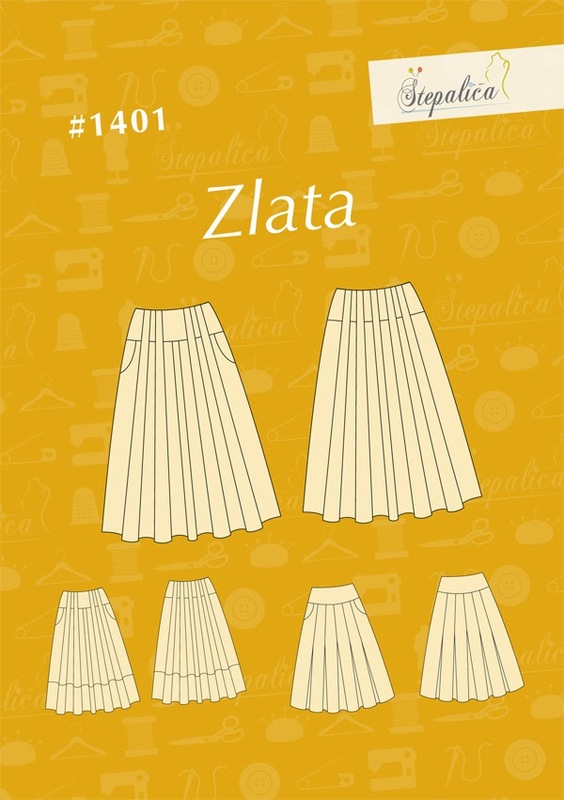 Today I'm going to show you the view A of the Zlata skirt pattern in detail. 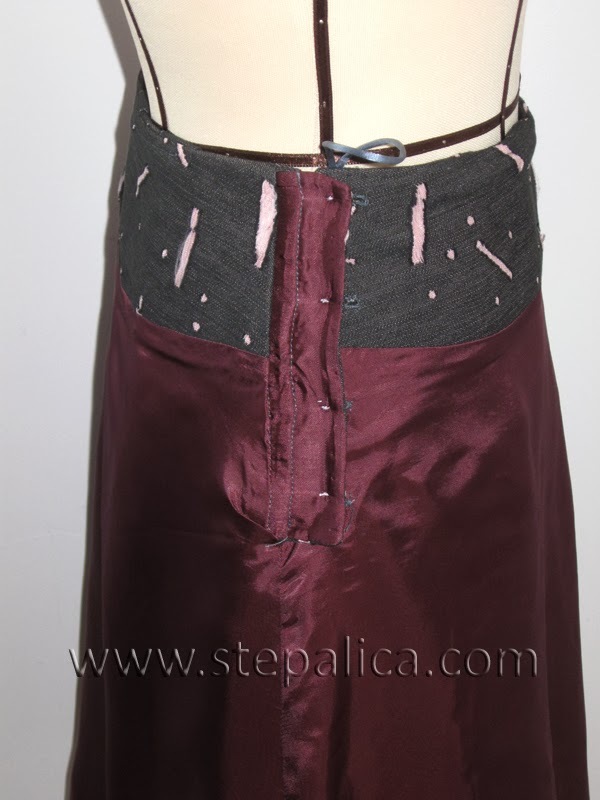 The original version of the Zlata skirt - the View A - was made last year, after several failed attempts to make a pleated skirt with pleats transforming into belt loops. I was literally haunted by the idea until I found a way to integrate such detail into a pattern. I added the pockets to the skirt to make it more practical. I mean, who doesn't love pockets on skirts? 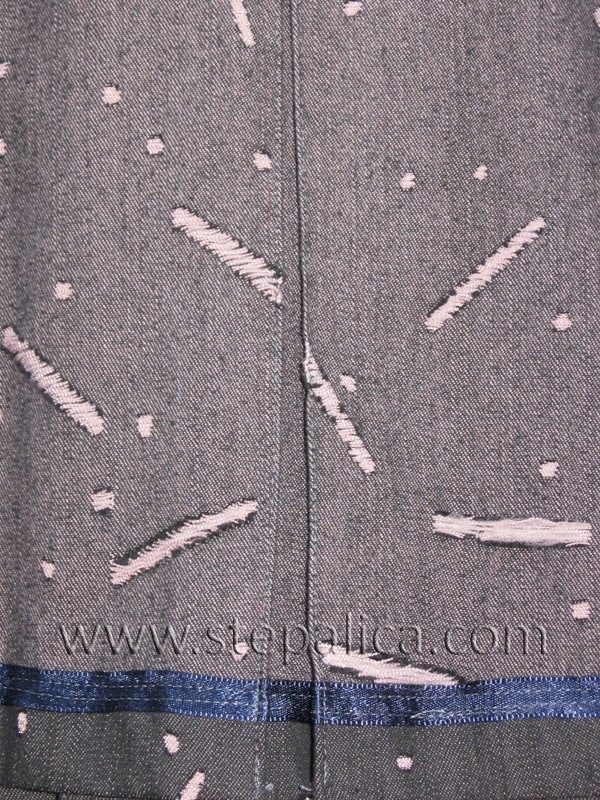 This variation is made of denim which is weft with pink threads in it, and the fabric was later on sliced using a laser knife, so that the pink weaving threads form a pattern on a surface. 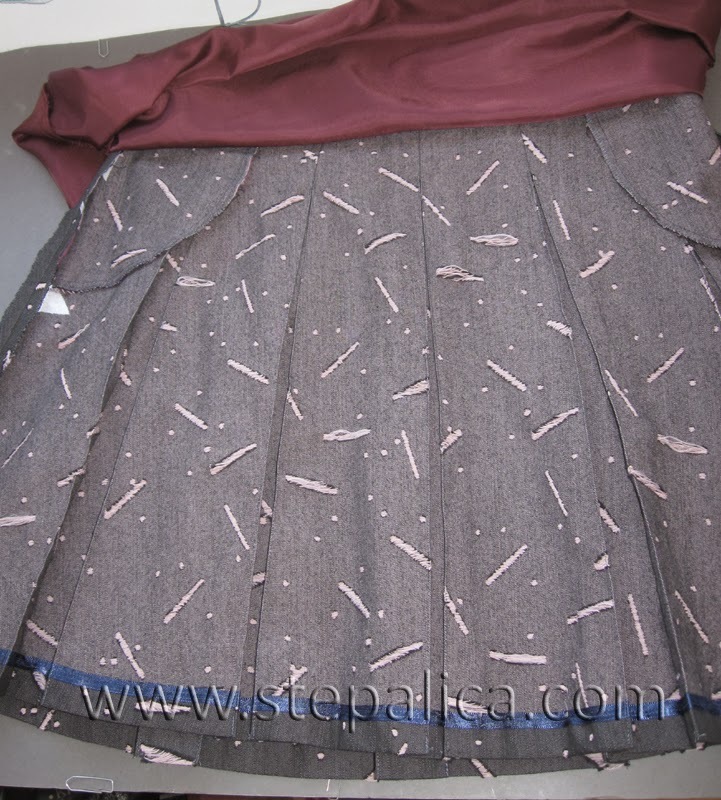 When I bought the fabric, I didn't think the skirt would look as interesting as it does, since the pale pink is not one of my favorite colors and I was a bit afraid the pink undertone would make the skirt difficult to combine with other colors. However, it turned out this shade of pink is rather neutral, and the skirt can easily be matched with a wide range of colors, with red and black being ones of those (quite unexpectedly to me). 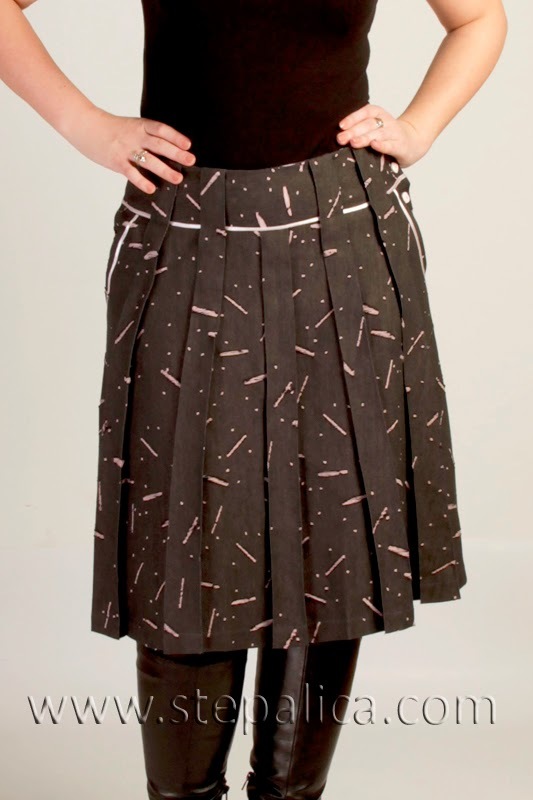 This skirt features a button closure instead of usual invisible zipper. I have to admit, the button closure is not included in the pattern, but I couldn't resist these lovely pale pink square buttons. I'll start the sewalong pretty soon, and I'll describe how I made the button closure in one of the sewalong posts, as I believe it is a very interesting detail. 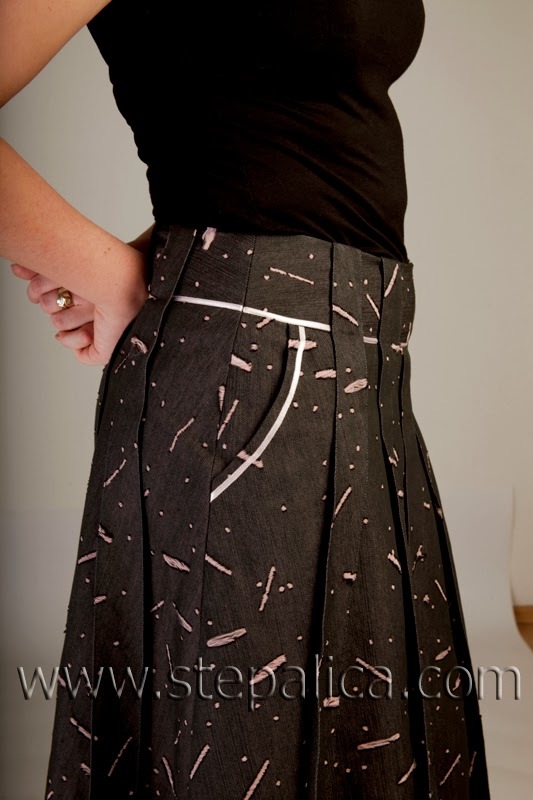 Also, note how the pleats stand free bellow the waistband, as they are not fixed to the skirt. I like this detail very much, since the pleats form an interesting and unusual relief along their length. 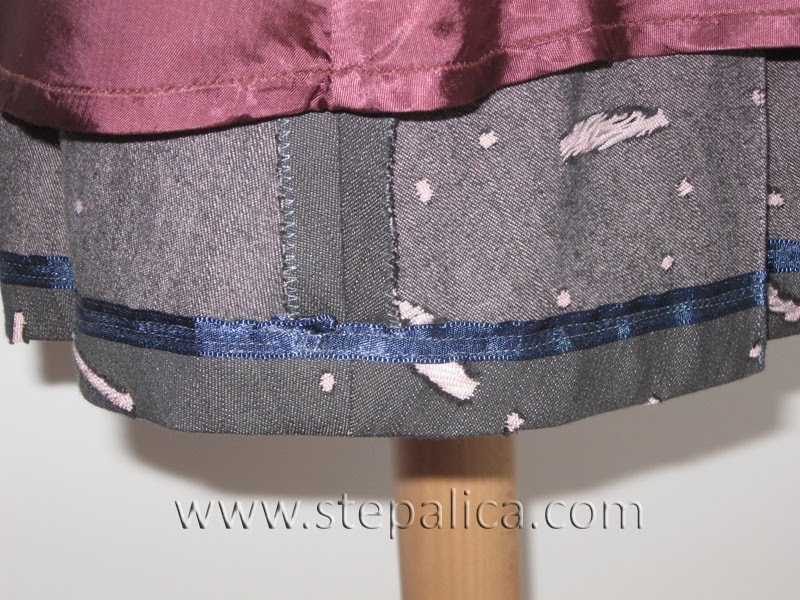 Along with the button closure, the skirt is trimmed with a pale pink satin band which is sewn on along the pockets and the bottom of the waist band. The satin ribbon and the buttons matched so nicely with the pink threads from the weaving, which was a lucky coincidence, since both were from my notions stash. The satin ribbon looks slightly lighter than the weaving threads, but that's just the flash reflection. 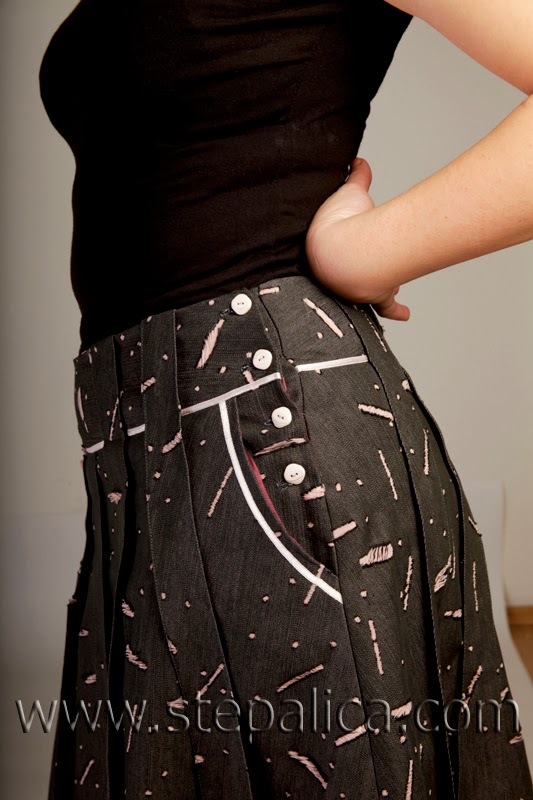 The satin ribbon on the waistband perfectly accentuates the transition between the waist yoke and the belt pleats. 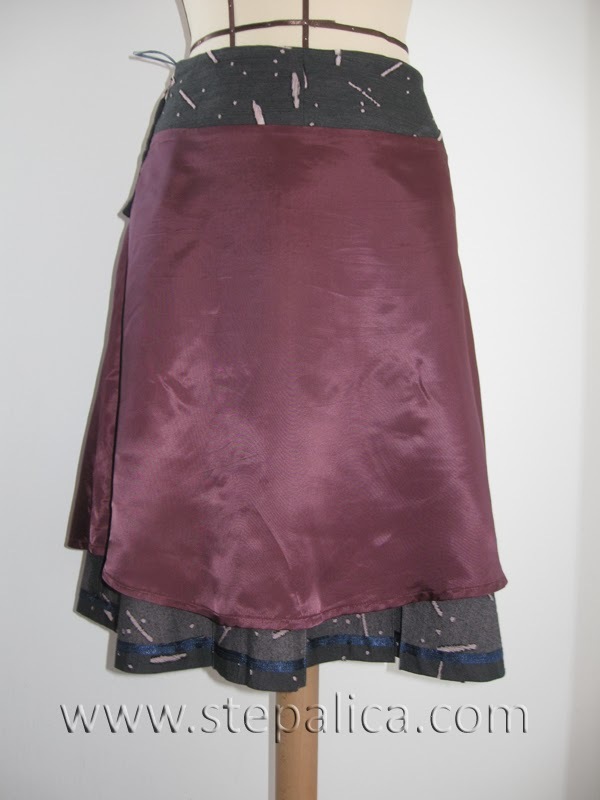 The skirt is lined with a deep cherry lining. I liked the contrast between the colors of the two fabrics. All pleat folds were edge-stitched using a thread in a matching colors. I was in doubt whether to use a thread that blends in or a contrasting one, but I wanted to make the skirt more formal and less casual, so I opted to use the matching thread. 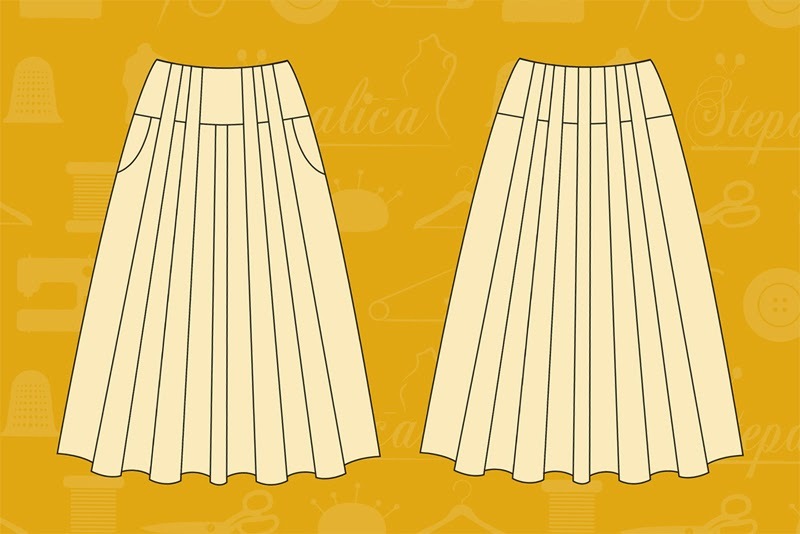 The pleats are edge-stitched along their folds on both right and wrong sides of the fabric. That was a lot of edge-stitching, since every pleat has two folds on the right side and two on the wrong side of the fabric, and there are ten pleats on the skirt, which makes a total of 40 stitches! Honestly, this part of the sewing was really tiresome and boring, so I sewed in stages. 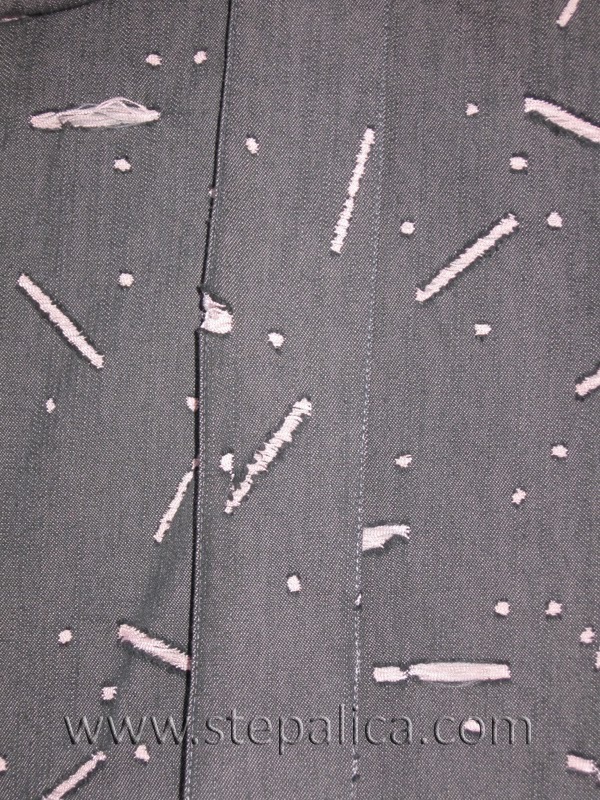 On the other side, the edge-stitching will make the skirt easier to maintain and iron, so I was determined to do it. 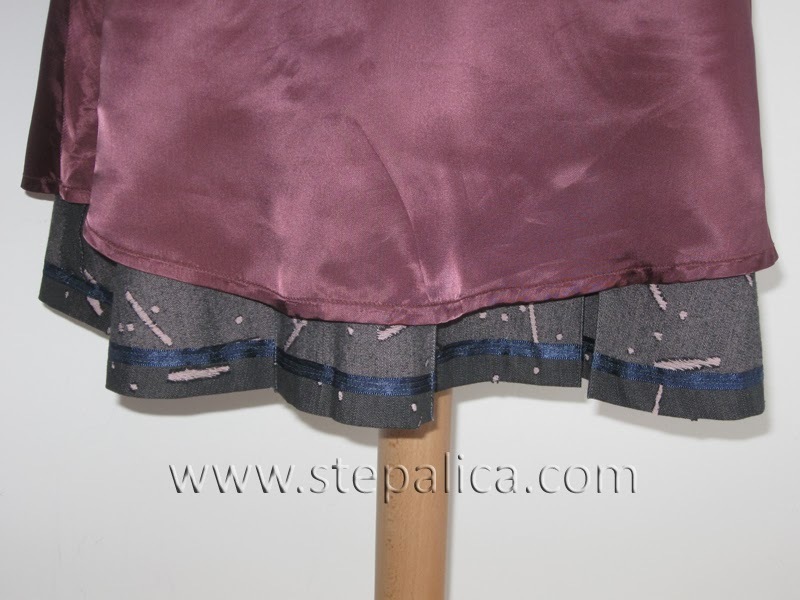 The skirt is hemmed by machine, but I hid the raw edge of the hemline under a satin ribbon. This gives such a nice finishing detail, and it's so easy to do.